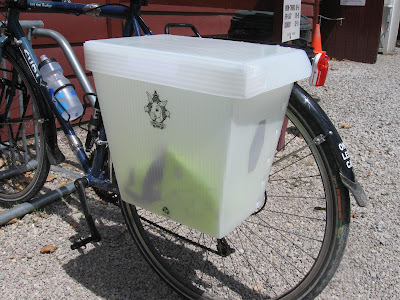 The makers of the Donkey Boxx bicycle pannier sent a free sample to where I work, so I decided to give it a try during my daily commute for a couple of days. What is the Donkey Boxx? 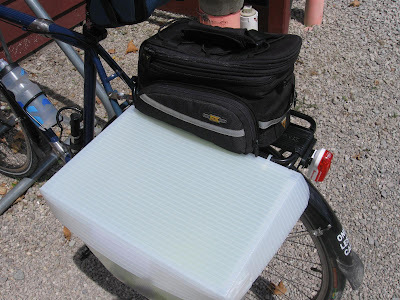 It’s a hard-sided pannier meant to be used with front or rear cargo racks, just like a standard pannier bag. The designers were inspired by the need to carry tomatoes and other produce home from their local farmer’s market without them getting bruised and jostled around as they would in a soft-sided bike bag. 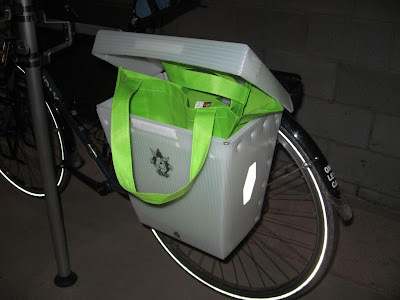 The Donkey Boxx is targeted at the commuter or bike tourist who is looking for a no-frills pannier that is simple to use, and does not attract the attention of theives with a flashy expensive outdoor gear look. It works equally well on either the left or right side; if you want to use them on both sides, you’ll have to buy two, as they are sold as a single box. The Donkey Boxx is made in the USA out of 80% recycled corrugated plastic. This is the same plastic that is used in those crates used by the US Postal Service, and found in corporate mailrooms all over the place. The plastic material itself is waterproof, but the Boxx has holes in the bottom and along the edges for drainage and ventilation. If you want to make the box as close to waterproof as possible, they suggest covering the holes with packing tape. 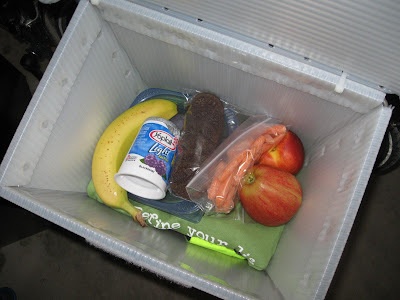 The Donkey Boxx comes with a set of zip ties for installation, reflective stickers, and a strip of velcro that is used to hold the fold-up lid shut. Installation was about as simple as you can get; just wrap two of the zip ties around the top edge, and one around the back near the bottom edge. Trim the ends off the the zip ties, and you’re good to go. The instructions provide tips for how to install the Donkey Boxx to avoid having heel strike problems. They even provide a unique measurement gauge to help you with this. One end of the gauge has a hook that attaches to your pedal spindle, and the other end has hash marks representing a range of shoe sizes. With the gauge hooked to your pedal, all you have to do is make sure that the Donkey Boxx is positioned so that the front edge is behind the marking for your shoe size. With the long chain stays of the Long Haul Trucker, this was not an issue for me; I could be wearing a size 16 and still not be even close to having a problem. Regardless of your bike or shoe size, I’d suggest just positioning the Donkey Boxx as far back as possible on your rack. 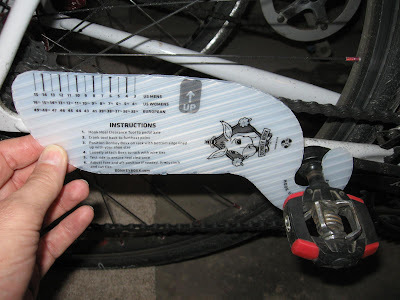 The only suggestion I would make for improvement would be to print the shoe size marks on both sides of the clearance gauge to make it easier for folks to size up the Donkey Boxx position on either side of their bike. My conclusion regarding the Donkey Boxx is that it works exactly as intended. If you’re looking for a low-cost cargo carrier that you can load up and knock around without worrying about it getting ripped or ripped off, then the Donkey Boxx is for you. If you need something that you can detach and take along with you, then it won’t work well, as the installation is semi-permanent using zip ties. 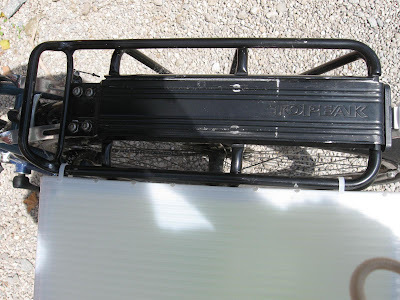 If you do need to remove the Donkey Boxx, you have to cut the zip ties. That’s not a major problem if you’re only doing this occasionally, since extra zip ties are readily available at your local hardware store. The only problem I had was that I would occasionally knock the box against doorways as I carried my bike in and out. That’s not really a fault with the Donkey Box itself; that’s just a matter of getting used to the fact that you’ve got a nice, big solid box attached to your bike. The Donkey Box comes only in the white color shown; the designers are considering offering other colors in the future. The plastic surface is smooth and friendly to user-customization with stickers. Check with your local bicycle shop for availability of the Donkey Boxx. Suggested retail price is $28.00 each. You can also order online (as well as find more information, including installation tips and frequently asked questions) at www.donkeyboxx.com. Now that my test period of the Donkey Boxx is complete, I am donating it to a worthy successor. If you’d like to inherit my Donkey Boxx to give it a try, I’ll give it to the first person that requests via the Contact page. Provide your name and mailing address, and I’ll get back to you with the shipping fee that you’ll need to reimburse to me before I send you the box. If you are local to Northeast Ohio, we can make arrangements for you to pick it up in person instead. UPDATE 09/17/2011: The Donkey Boxx has been claimed; congratulations to Rocky Conly of Austin, Texas. Check back later for a report of his experiences using the Donkey Boxx.